(Photo: Reuters / Charles Platiau)Marine Le Pen, France's National Front political party leader, delivers her speech at their traditional rally in Paris May 1, 2013. BRUSSELS (Reuters) - French far-right leader Marine Le Pen could face charges over remarks comparing Muslims praying in the streets to the wartime Nazi occupation, after European lawmakers voted to strip her of parliamentary immunity. The French justice ministry asked the European Parliament last year to waive Le Pen's immunity over the comments, made at a rally in 2010 before she took over leadership of the National Front party founded by her father, Jean-Marie. The European Parliament's legal affairs committee voted in favour of lifting the immunity this week, officials said on Saturday, paving the way for a plenary vote later in the month. "The vote on lifting of the immunity is scheduled for the next session," parliament spokeswoman Marjory van den Broeke said. Since taking control of the party in early 2011, Le Pen, 44, has tried to widen the National Front's appeal by expelling extremists and cracking down on racist talk and anti-Semitism. Prosecutors in Lyon, in eastern France, opened a preliminary investigation in January of 2011 for incitement to racial hatred after an anti-racism NGO filed a complaint against Le Pen for the comments at the rally. The far right leader has said that she was not specifically referring to the Nazi occupation. "I'm sorry, but for those who really like to talk about World War II, if we're talking about occupation, we could talk about that (street prayers), because that is clearly an occupation of the territory," she told the 2010 rally. "It is an occupation of sections of the territory, of neighbourhoods in which religious law applies, it is an occupation. There are no tanks, there are no soldiers, but it is an occupation anyhow, and it weighs on people," she added. A member of the European Parliament since 2004, Le Pen scored nearly 18 percent of the vote in the first round of the French presidential elections last year. 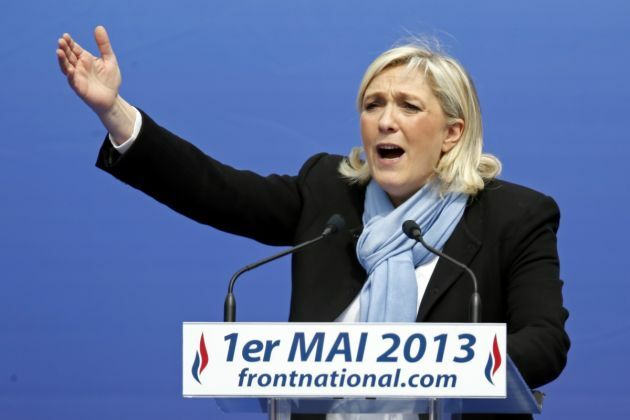 National Front officials say efforts to strip her of the immunity are politically-motivated. "Since she cannot be silenced in the polls people try to silence her through the courts," said party vice-president Florian Philippot. "They want to silence her because she dares to tell the truth ... It would be much better to devote energy to the problem of street prayers."